Small dogs play big! Hartz understands that even though we are small, we are also mighty! Hartz sent me a box of cool products made specially for small dogs. They want to know my opinion of these small dog items. Naturally, I am pawfectly happy to try them out. 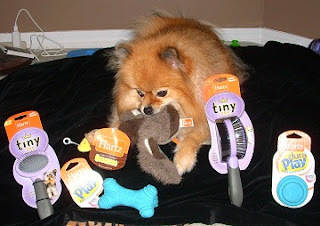 Hartz has toys designed to fit small dogs that are big fun! 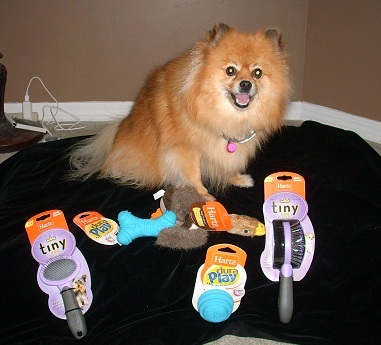 These toys are like their regular toys, but in a smaller size for dogs under 20 pounds. Of course I went for the Nature's Collection Quackers first! I have a thing for stuffie duck toys. BOL! The stuffies in the Nature's Collection look so realistic. They make pawsome prey! BOL!! Quack quack! My duck Mom! You can not have it! Fetch! BOL!! Mom snapped a photo as I jumped over my bed & blanket. 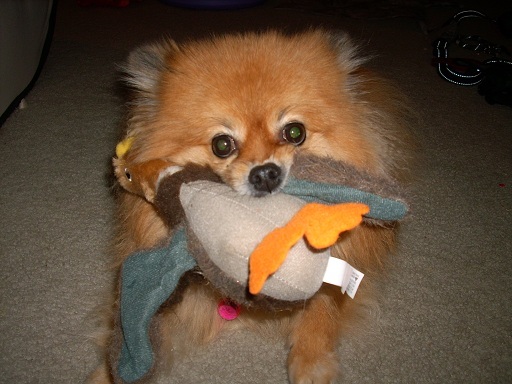 This duck honks just like my favorite old big duck, but it is easier to fetch. I have been carrying it around the house ever since I got it. But I am really into the ball! This is my favorite rubber toy now. Dura Play toys have a durable combination of latex over a foam core. This bouncy ball is small enough for me to pick up and carry. Dura Play toys float in water! Of course we still like to look pretty even after a ruff & tumble play session. Hartz has our good looks covered with their Tiny Dog grooming brushes. Yes, that is some of my fluff caught in the bristles. BOL! I use both the slicker brush and the combo brush. They both work pawsome! These brushes are designed to make grooming more comfortable for small dogs (and their humans). The small heads fit our contours better than large brushes, and they still have full sized handles for our human's comfort. Old full size brush with wood handle on left. 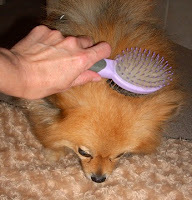 New Hartz Tiny dog brush with a comfortable handle on right. 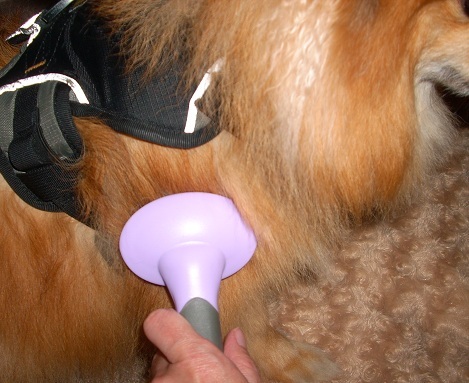 With my old full sized brush, sometimes it would accidentally bump my knees when Mom was brushing my hips. I don't like to have my knees bumped. 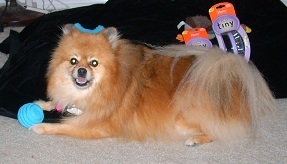 The Hartz Tiny dog brush is small enough to brush my hips without bumping my knees, or catching my tail. 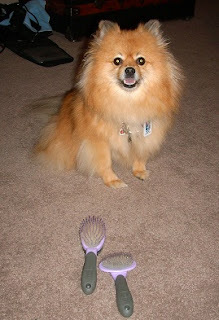 I prefer the Hartz Tiny dog brushes. I am so happy I have them now. Do you have a favorite brush and/or toy? What makes it your favorite? Review Disclaimer: I did not receive any monetary compensation for this review. I was given free products to review. The opinions in this review are my own and not influenced by any outsider . I receive no additional benefits for talking about the products or company. COOL!! 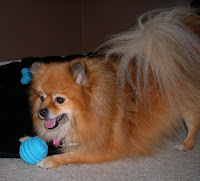 I love anything squeaky! As for brushing, I don't like it at all but put up with it. BOL!! I understand Pooks! Sometimes I like my back brushed, but I don't like to have my hips brushed. 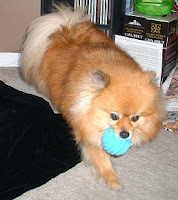 I love things that squeak too! Oh Pepper...you got more cool stuff AGAIN!!! BOL I have a duck that honks too, but I don't think it is as small as yours. Those look like pawesome toys. Even the brush is nice (though I hate being brushed). I do adore duck toys! Bol!! Another small dog who isn't thrilled with brushing. I wonder how many small dogs are like us. BOL!!! He hides your squeaky from you. Oh no! At least your mom gives it back to you! BOL!! Pawsome that you can use it for training! High Paw! Whoa! Free toys. How lucky can you get. And it wasn't even your birthday. MOL! Thanks for coming to my pawty. Hope you had fun. It was a pawsome pawty CK! I hope you had a wonderful purrday! I do love to get toys!!! BOL!! It's like having more than one barkday! You are so good looking - you should be the Hartz model!